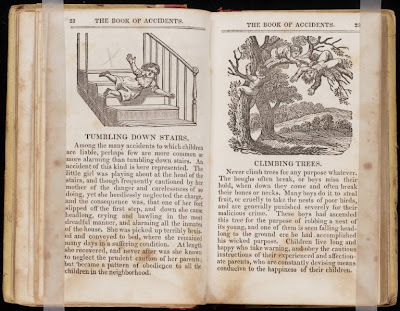 In 1831, author S. Babcock published a helpful guide to the "accidents to which children, from their inexperience or carelessness, are liable." He gave his work what may be the best title in the history of publishing: The Book of Accidents. 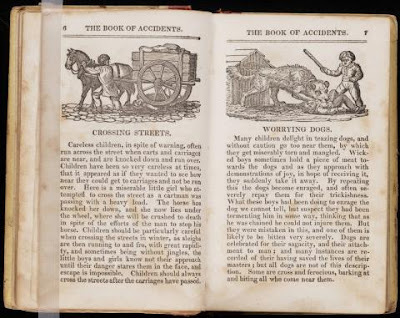 The book warned children not to cross streets, climb trees, or tease dogs. 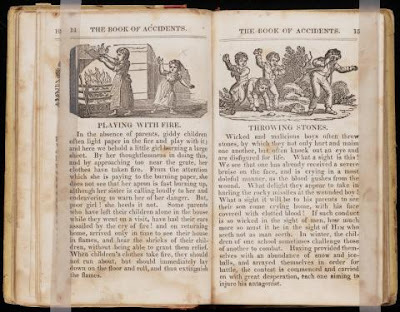 There were even handy pictures, in case anyone didn't quite grasp the dangers of playing with fire or throwing stones. The entire book can be found here. Read it immediately--before it's too late! Via Room26 Cabinet of Curiosities. Oh my word! That book would sound like a to-do list instead of a caution guide to most of the guys I know. That is so so so FUNNY! "(So I guess it's okay for girls to climb trees.)" Poor kids who read that. (and listened to it) I bet they were ruined for life. Glad I could always climb trees. Does anyone know the best size engine to use for a model rocket? Last time I used an E engine I nearly blew up my house. MY favorite bit was that after the wee chickie fell down the stairs, she was this model of obedience. It's funny how the blood in the gory illustrations always falls straight down. Sry, I notice odd things. that book would make my life so boooooooring. I completely agree with Phoenix xD. The sad part is that all those things are very likely for me. But I like playing with fire! "Your query encountered the following error: Arguments are of the wrong type, are out of acceptable range, or are in conflict with one another." D: Oh and what's with the tape stuff on the book edges? There is some truth to certain parts of it, but I rest my case. Oops. I'm not sure what happened, but it appears that the link only works after you get there from the other link. LOL, I agree with Macy. Or was young, unmarried, and very naive when he wrote the book. It says 'Never climb trees for any purpose whatever'. Isn't it meant to be whatsoever? I've fallen down the stairs 2 or 3 times and ended up with tears. I always used to fall over. I climb the roof of my house. I love climbing but I've never tried climbing a tree... I climb fences a lot. Ok, girls! Let's go tree climbing. yay! Or, Jin Ai, he could have been one of those horrifically accident-prone children...I know one of those. I am always amazed at the fact that he is at school every Monday morning. Its really funny to listen to his stories of his weekend exploits. Wow...I think this book would have come in handy when I was little. One of my first memories is falling backwards down the stairs! "gee whilikers, i'll never climb a tree again!" pft, yeah right... and so prejudiced against us girls... god, life would be no fun w/out accidents!!!!!!!!! !